10/22/2016 – “Nothing Goes to Waste” has been reprinted in the inaugural issue of Hair Trigger 2.0 – you can find it here. “Mirabilis” is available here in audio through Podcastle. 5/26/2016 – “Mirabilis” has been accepted by Podcastle and will appear later this year. 5/1/2016 – “A Beautiful Memory” has been nominated for the Shirley Jackson award in the Short Fiction category. 2/2/2016 – “Millepora” has been accepted by Flash Fiction Online and will appear later this year. 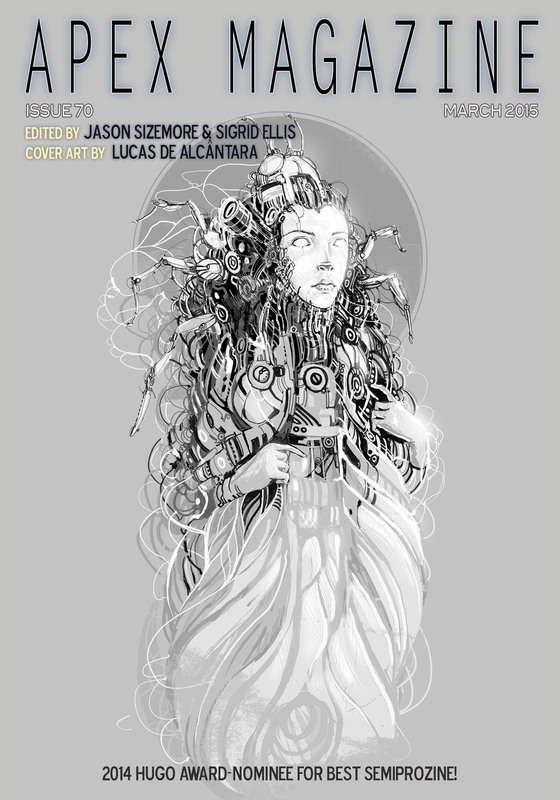 11/15/2015 – “Black Hearts” has been accepted by Pseudopod as part of their Artemis Rising 2 event. 10/1/2015 – “White Elephant” is now available at Flash Fiction Online. You can find it here as part of the October issue. 9/1/2015 – “Nothing Goes to Waste” is available in print! Find the issue here. 5/29/2015 – “White Poplar” is now available at Daily Science Fiction. You can read it here. 4/30/2015 – “The Snake-Oil Salesman and the Prophet’s Head” is live at Beneath Ceaseless Skies. 4/27/2015 – “Dogs From Other Places” is now available online as part of Edmund Schubert’s “Not a Hugo Sampler” issue of IGMS. You can find it and several other stories here. 4/10/2015 – “The Snake-Oil Salesman and the Prophet’s Head” has been accepted by Beneath Ceaseless Skies, to appear late this month. “Some People Belong Inside” is now live at The Masters Review, and can be read here. 3/27/2015 – “Nothing Goes to Waste” has been accepted by Lightspeed: QDSF!, to be published later this year. 3/18/2015 – “Some People Belong Inside” has been accepted by The Masters Review: New Voices, and is scheduled to come out in April. 3/3/2015 – “A Beautiful Memory” is live at Apex. You can find it here. 1/12/2015 – “White Poplar” has been accepted by Daily Science Fiction, to be published later this year. 1/9/2015 – “Animal Magnetism” is up at Urban Fantasy Magazine. You can read it here. 12/10/2014 – My Clarion West Week 3 story has been accepted by Urban Fantasy Magazine and will be published sometime next year. 10/10/2014 – “At First Glance” has been published by Daily Science Fiction. You can read it here.